Groups love the Grand Rapids Public Museum! 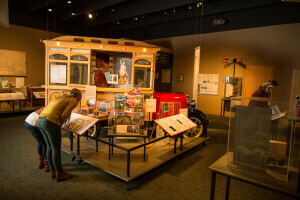 With fascinating exhibits on three floors, the Museum offers a unique and entertaining experience for everyone. A convenient drop off location for motorcoaches is available at the main entrance, under cover from the weather and an elevator inside ensures access for everyone. The Museum Cafe overlooks the Grand River and the city center, and offers homemade soups, snacks, salads, sandwiches, desserts and a daily special. Don’t forget to make time for a stop at the Curiosity Shop! The GRPM is centrally located in downtown Grand Rapids, across the street from the Gerald R. Ford Presidential Museum. Park the coach and it’s a short walk to both. The Frederik Meijer Gardens and Sculpture Park is only 15 minutes away. Adult Group Scheduling Information Groups of 20 or more people receive reduced admission of $7 per adult or $6 per senior. Special exhibits may have additional fees. Guided programs are an additional $4-$5 per person. Planetarium shows – $4 per person with general admission. Planetarium Only visit – $5 per person without general admission. One group leader and bus driver are FREE with a group; additional group leaders pay general group rate admission fees. Group catering is also available for an additional fee; advanced reservations are required. 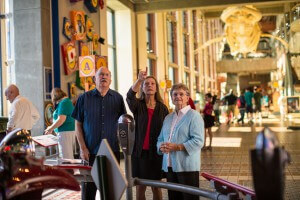 GENERAL MUSEUM TOUR: Tour the Museum with a knowledgeable guide who will point out highlights. Tour can be tailored for groups with specific areas of interest. Offered year-round for adults, the tour lasts 60 minutes. 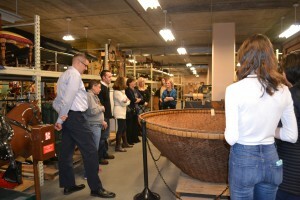 NEWCOMERS: Diversity is the theme as your group tours the exhibition Newcomers: The People of This Place to learn about more than 45 ethnic groups that call Grand Rapids home. The tour lasts 60 minutes. CARC BEHIND THE SCENES TOUR: This peek behind the curtain gives a glimpse at how the Museum manages, stores, catalogs and preserves the Collections at the Community Archives and Research Center. Our facility houses nearly 90% of the Collections and is not open for public hours.